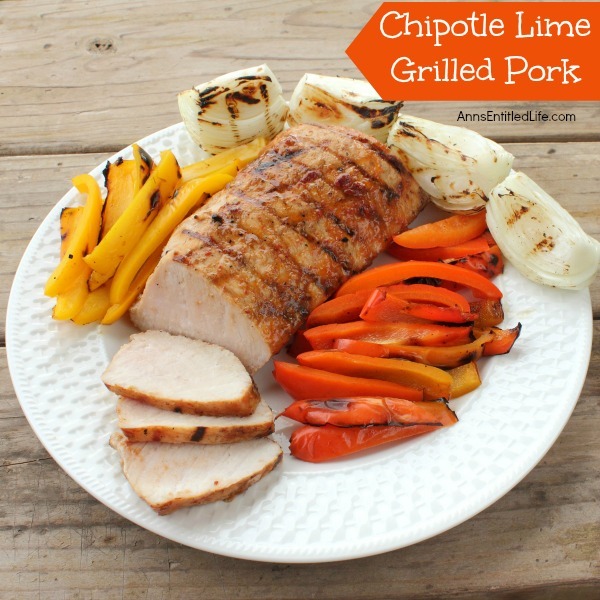 Easy to make, the smokey grilled pork is so juicy and bursting with chipotle lime flavor, your taste buds will sit up and take notice. A wonderful meal straight from the barbecue. • In a blender combine olive oil, lime juice, peach preserves, chipotle peppers and salt; blend until smooth. • Place pork tenderloin in a resealable plastic bag and add all but a ¼ cup of the olive oil and chipotle pepper mixture. Seal and let pork marinate in the refrigerator at least 1 hour, up to 4 hours. • Lay your peppers flat on a cutting board stem away from you. Cut down one side of the pepper and roll the pepper as you cut. You should end up with one long piece of pepper with the core, seeds and bottom left together connected by the white inner ribs. • Cut the onion into quarters vertically through the root end, allowing the root to hold the layers together. • Preheat grill to medium high heat. If using charcoal set it up to have an area of direct heat and indirect heat. 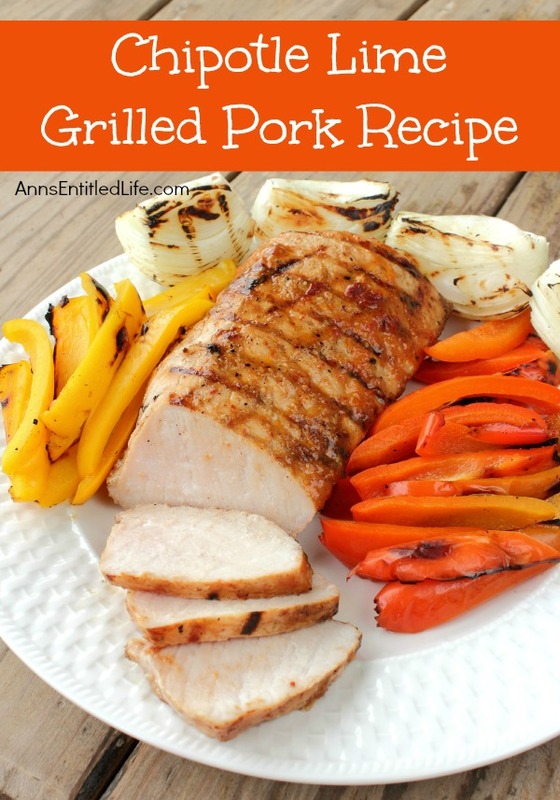 • Grill the marinated pork tenderloin 4 minutes on each side to get a good sear, then move to indirect heat and cook an additional 8-10 minutes per side with the lid down. Use the marinade in the bag to give a good coat when you move to indirect heat; simply pour it over the meat slowly then cover. Don’t worry; it is going to cook at least an additional 15 minutes at 300˚+. • Allow the pork tenderloin to cook until the internal temperature reaches 145˚-150˚ (use a meat thermometer). • Remove, cover with foil and let rest 10 minutes. • While the pork tenderloin is resting put the peppers and onions on the grill over direct heat and cook until slightly charred turning as necessary. Lay the peppers with the short side perpendicular to the grates so they won’t slip through. • Remove from grill and cut the peppers into strips and cut the root end off of the onions and separate into layers. • Serve warm with a dollop of sour cream and reserved ¼ cup of marinade if desired. 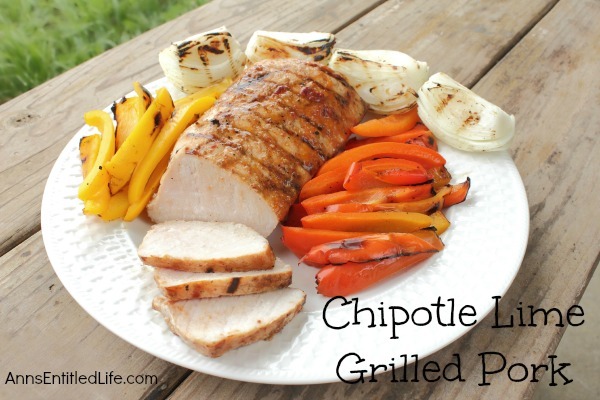 • To print the Chipotle Lime Grilled Pork recipe click here. This is a pretty darned easy recipe to make and have a complete dinner when paired with a salad. The mix of chipotle and lime is a flavor sensation; your taste buds will truly be impressed. A wonderful meal on a hot summer night when you don’t want to turn on the stove!